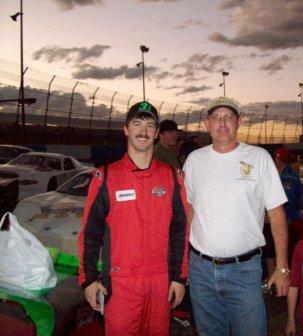 You'll find attached photos of the car and pictures of Duane Hunt Jr. (with yours truly). This is a big event and I hope it will bring in a lot of positive feedback to the Man Cave phenomenon. Good luck Duane!!! Keep the ManCaveSite.org racecar winning streak going!!! Wow Mike!! What a year it's been for your first year sponsoring cars! You have multiple cars, a championship car and now on TV!!!!!!! Congrats!!! Just finished 17th out of 40 cars!!! Good job avoiding all the wrecks Duane!! Great job Duane! 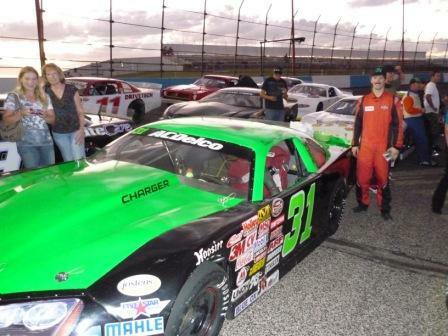 Out of 40 of the top drivers across the country you finished 17th! Had a whole crowd at Famous Sams cheering you on!